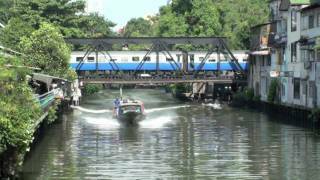 N 13° 45' 14" and E 100° 30' 5"
Bangkok in Bangkok with it's 5,104,476 inhabitants is located in Thailand. It's the capital of this country. 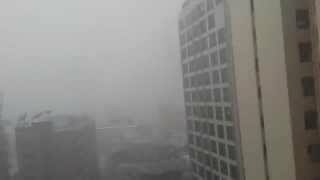 Local time in Bangkok is now 02:26 AM (Tuesday). The local timezone is named Asia / Bangkok with an UTC offset of 7 hours. We know of 8 airports in the wider vicinity of Bangkok, of which two are larger airports. The closest airport in Thailand is Don Mueang International Airport in a distance of 13 mi (or 21 km), North-East. Besides the airports, there are other travel options available (check left side). There are several Unesco world heritage sites nearby. The closest heritage site in Thailand is Historic City of Ayutthaya in a distance of 41 mi (or 66 km), North. If you need a place to sleep, we compiled a list of available hotels close to the map centre further down the page. Depending on your travel schedule, you might want to pay a visit to some of the following locations: Phra Nakhon, Pom Prap Sattru Phai, Khlong San, Bangkok Noi and Samphanthawong. To further explore this place, just scroll down and browse the available info. Let's start with some photos from the area. 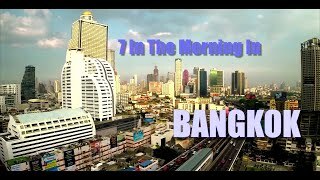 Bangkok, capital da Tailândia, é uma cidade das melhores cidades para se visitar no mundo. Divirta-se com esse vídeo no nosso giro por Bankok. Acesse nosso site: www.nomundo.com.br. Located at 13.7514, 100.493 (Lat. / Lng. ), about 1 miles away. Located at 13.753, 100.491 (Lat. / Lng. ), about 1 miles away. Located at 13.7589, 100.497 (Lat. / Lng. ), about 0 miles away. Located at 13.7567, 100.502 (Lat. / Lng. ), about 0 miles away. The Giant Swing is a religious structure in Bangkok, Thailand, Phra Nakhon district, located in front of Wat Suthat temple. It was formerly used in an old Brahmin ceremony, and is one of Bangkok's tourist attractions. Located at 13.7519, 100.501 (Lat. / Lng. ), about 0 miles away. Wat Ratchanaddaram is a buddhist temple located at the intersection between Ratchadamnoen Klang and Maha Chai Road, in Phra Nakhon district, Bangkok. Meaning Royal Niece, the temple was built to the order of King Nangklao (Rama III) for Mom Chao Ying Sommanus Wattanavadi (หม่อมเจ้าหญิงโสมนัสวัฒนาวดี) in 1846. The temple is best known for the Loha Prasat (โลหะปราสาท), a multi-tiered structure 36 m high and having 37 metal spires, signifying the 37 virtues toward enlightenment. Located at 13.7547, 100.505 (Lat. / Lng. ), about 0 miles away. Wat Suthat Thepphawararam is a royal temple of the first grade, one of ten such temples in Bangkok (23 in Thailand). Construction was begun by His Majesty King Rama I in 1807 (B.E. 2350). Further construction and decorations were carried out by King Rama II who helped carve the wooden doors, but the temple was not completed until the reign of King Rama III in 1847 (B.E.2390). This temple contains the Buddha image Phra Sri Sakyamuni or "Sisakayamunee" which moved from Sukhothai province. Located at 13.7506, 100.501 (Lat. / Lng. ), about 0 miles away. Sanam Luang is an open field and public square in front of Wat Phra Kaew and the Grand Palace, Bangkok, Thailand. Sanam Luang is located in the Phra Nakhon district, the historic center of Bangkok. It was written in the Royal Chronicle as follow that : "In front of Wat Mahathat, Sanam Luang lies between the Royal Palace and the Front Palace. Located at 13.755, 100.493 (Lat. / Lng. ), about 1 miles away. 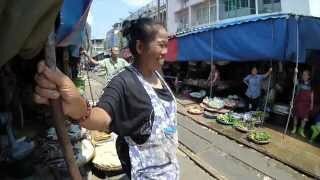 Nakhon Kasem is a market in Samphanthawong district, Bangkok, Thailand. Popularly known as Thieves Market because in past it were mostly stolen goods which were sold there. Nowadays mostly imitation antiques, old furniture and brassware are sold there. This market is located at Charoen Krung Road. Located at 13.7453, 100.505 (Lat. / Lng. ), about 1 miles away. Wat Bowonniwet Vihara Rajavaravihara is a major Buddhist temple in Phra Nakhon district, Bangkok, Thailand. The temple is a center of the Thammayut Nikaya school of Thai Theravada Buddhism and has been a major temple of patronage for the Chakri dynasty. It is the shrine-hall of Phra Phutthachinasi (พระพุทธชินสีห์) which was moulded in about 1357. It is where many royal princes studied and served their monkhood, including king Bhumibol. Located at 13.7594, 100.501 (Lat. / Lng. ), about 0 miles away. Wat Saket Ratcha Wora Maha Wihan (Thai: วัดสระเกศราชวรมหาวิหาร, usually shortened to Wat Saket) is a Buddhist temple in Pom Prap Sattru Phai district, Bangkok, Thailand. The temple dates back to the Ayutthaya era, when it was known as Wat Sakae. When Bangkok became the capital, King Rama I renovated the temple and gave it its present name. Located at 13.7539, 100.507 (Lat. / Lng. ), about 0 miles away. Mahamakut Buddhist University or MBU is one of the two public Buddhist universities in Thailand. Founded in 1893 as an educational institute for monks, by King Chulalongkorn in remembrance of his late father King Mongkut. 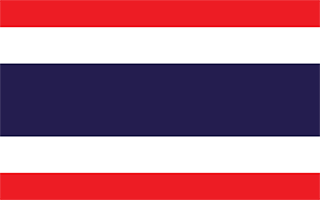 The Thai government granted the university a status of public university in 1997, integrating MBU into the Thai higher education system. Located at 13.7592, 100.501 (Lat. / Lng. ), about 0 miles away. Wat Mahathat Yuwarajarangsarit Rajaworamahavihara is a Buddhist temple in Bangkok, Thailand. It is one of the 10 royal temples of the highest class (Thai: พระอารามหลวง ชั้นเอก ชนิดราชวรมหาวิหาร) in Bangkok. Located at 13.755, 100.491 (Lat. / Lng. ), about 1 miles away. The National Gallery of Thailand is an art gallery located in Bangkok, Thailand. Located at 13.7589, 100.494 (Lat. / Lng. ), about 1 miles away. Phahurat or Pahurat, often known as Thailand's Little India, is an ethnic neighborhood surrounding Phahurat Road in Phra Nakhon District, Bangkok. The area that would become Phahurat was an enclave of Cambodian immigrants who came to Siam during the reign of King Taksin (1768–1782). Located at 13.7448, 100.501 (Lat. / Lng. ), about 1 miles away. The Bangkok National Museum is the main branch museum of the National Museums in Thailand. It features exhibits of Thai art and history. The museum was established and opened in 1874 by King Rama V to exhibit relics from the rule of King Rama IV's rule. Today the galleries contain exhibits covering Thai History back to Neolithic times. Located at 13.7575, 100.492 (Lat. / Lng. ), about 1 miles away. 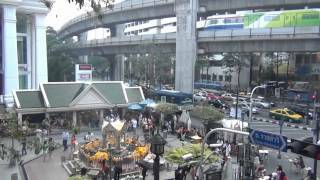 Charoen Krung (ถนนเจริญกรุง, Thanon Charoen Krung)) is a major road in Bangkok that runs roughly parallel to the Chao Phraya river. Part of it is considered Chinatown along with Yaowarat Road, part of it is closest major road to Phahurat (Little India), its northern terminus is the Grand Palace, it runs through Nakhon Kasem (Thieves Market) and Khlong Thom Market (low cost electronics). Located at 13.7471, 100.498 (Lat. / Lng. ), about 1 miles away. The National Art Gallery of the Thailand is the main exhibition gallery for modern art, located in Bangkok. The National Library of Thailand is the legal deposit and copyright library for Thailand. It was created in 1905, after the merger of the three pre-existing royal libraries. It operates under the jurisdiction of the Fine Arts Department of the Ministry of Culture and is located in Bangkok. The library aims to be a fully high-tech national intellectual property heritage resource, serving all people and guided by professional library leadership. Located at 13.7521, 100.505 (Lat. / Lng. ), about 0 miles away. 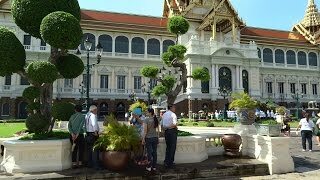 King Prajadhipok Museum is a museum in Bangkok, Thailand. Located at 13.756, 100.507 (Lat. / Lng. ), about 0 miles away. Silapakorn University Art Gallery is an art gallery and museum in Bangkok, Thailand. It is located in a charming old building in Silpakorn University Art Center on the Tha Chang campus on Na Pralarn Road, directly north of the Grand Palace and south of Wat Mahathat. Silpakorn University (also known as the University of Fine Arts) was founded in 1943 by Italian artist and sculptor Corrado Feroci, a native of Florence, Italy who became a naturalised Thai citizen and took the name Silpa Bhirasri. Located at 13.7527, 100.491 (Lat. / Lng. ), about 1 miles away. Sala Chalermkrung Royal Theatre is a theatre in Bangkok, Thailand. It was established in 1933. Originally it was called "Sala ChalermThai" (สาลาเฉลิมไทย), "Glory of Thailand". After serving as a cinema for many years it now hosts performances of classical Thai dance theatre. Located at 13.7467, 100.5 (Lat. / Lng. ), about 1 miles away. The Ministry of Interior of the Kingdom of Thailand is an important Cabinet-level department in the Government of Thailand. The Ministry is given wide ranging responsibilities over many aspects. For example the Ministry has responsibility over: local administrations, internal security, citizenship, disaster management, land management, issuing national identity cards and public works. The Ministry is also responsible for appointing 76 Governors of the Provinces of Thailand. Located at 13.7504, 100.497 (Lat. / Lng. ), about 0 miles away. Wat Ratchabophit or formally Wat Ratchabophit Sathit Maha Simaram Ratcha Wara Maha Wihan is a Buddhist temple located in on Atsadang Road, Bangkok, along Khlong Lot, not far from Wat Pho and the Grand Palace. The temple was built during the reign of King Chulalongkorn (Rama V). Located at 13.7492, 100.497 (Lat. / Lng. ), about 0 miles away. Rattanakosin Island is a historic area in the Phra Nakhon District in the city of Bangkok, Thailand. It is bordered by the Chao Phraya and canals were dug to serve as moats for the originally fortified city centre. Situated on the eastern convex bank of a meander in the Chao Phraya River, the island is the site of the Grand Palace and Bangkok's City Pillar Shrine, among other places of historical significance. Located at 13.75, 100.5 (Lat. / Lng. ), about 0 miles away. These districts belong to Bangkok. These are districts that are close by, but belong to a different city than Bangkok. These are some bigger and more relevant cities in the wider vivinity of Bangkok.